On Trump’s North Korea Crisis (2017) and Kennedy’s Cuban Missile Crisis (1962). In 2014 nine nations around the world—including North Korea—have around 16,300 nuclear weapons. Estimates are that North Korea’s arsenal today may be about 20 warheads or higher. In descending order of warhead amounts, the other nuclear states are Russia (8,000 warheads), the U.S.A. (7,300), France (300), China (250), the UK (225), India and Pakistan (about 100 each) and Israel (80). According to the National Security Archive, the last tactical nuclear weapons left Cuba in December 1962. For a rogue state such as North Korea to possess nuclear weapons is dangerous and unpredictable to the region and world. Like JFK in the Cuban Missile Crisis in 1962, the U.S. must use its military and moral strength to seek and find a conclusion so that North Korea changes course on their nuclear weapons peacefully. Exactly what that change should look like is an important debate not explored here, but the U.S. must NOT and NEVER start or provoke a nuclear war to achieve it. Kennedy prepared for nuclear war during the Cuban Missile Crisis, but always carefully did not pull the trigger. There can be no close analogy between Cuba in 1962 and North Korea in 2017. Cuba is 90 miles off American shores and North Korea about 6,500 miles from the Continental U.S. In the Cuban Missile Crisis, those were clearly Russian nukes. The Cold War by the early 1960’s was a well-worn competitive geopolitical game that hadn’t yet completely played out. The Russians built a wall in Berlin in 1961; Kennedy quarantined Cuba in 1962. In 2017 what is the multiplicity of sources Trump can hold accountable for the North Korean weapons deployment in addition to the rogue regime? China? Russia? Iran? If Pyongyang is today as remote and obscure as the Kremlin was in Kennedy’s time, today’s political and military equations are even more tangled and complicated. Any calculations for war must include those who may or will get killed – and how many. Is American “hyper” power any good if its allies are casualties on a massive scale? No nuclear exchange must result with a hermit kingdom dictator who is not a friend of the U.S. or its allies in the region – especially if war may incalculably spread. If the U.S. has allies in the true meaning of the word then an attack on them by North Korea (or China or Russia) is equal to an attack on the homeland – otherwise what’s the point of the U.S. having allies at all? We must protect our allies in the region to the highest degree so to defend and preserve our esteemed alliances. In this dangerous politico-military crisis there are ramifications with severe strong risk for the U.S. as a global power and markedly in that part of the world. North Korea must somehow stand down for there to be success from the perspective of the U.S and its allies. Similar to the Cuban Missile Crisis that endured for 13 straight days—the Korean crisis has gone on arguably for over 60 years — patience and cool-headed leadership joined to a perfect calibration of carrot and stick (preferring the carrot) should serve as worthwhile qualities so to craft a necessarily peaceful and successful outcome. “Because of the ingenuity of science and man’s own inability to control his relations one with another,” said JFK in 1961 in Virtual JFK, “we happen to live in the most dangerous time in the history of the human race.” The film states that experienced military advisers believed that whenever Americans committed military force – they won the conflict. But as frequent and strong pressure by many advisers is put on Kennedy to commit the U.S. to a war, the president time and again chose to avoid both conventional and nuclear war. It may not be remembered today but after the failure of the Bay of Pigs in 1961, there was talk of John Kennedy’s impeachment for incompetence. Many in his own Democratic party wouldn’t support him because they had convinced themselves he wasn’t a serious political leader. In 2017 the defeat of 33-year-old Kim Jong-un’s nuclear threat short of war will not be simply a victory for the status quo but a step forward in terms of American leadership in that part of the world. An actual war, unless it could be completely nonnuclear, contained, and successful – which is improbable – cannot be in any civilized people’s self-interest. 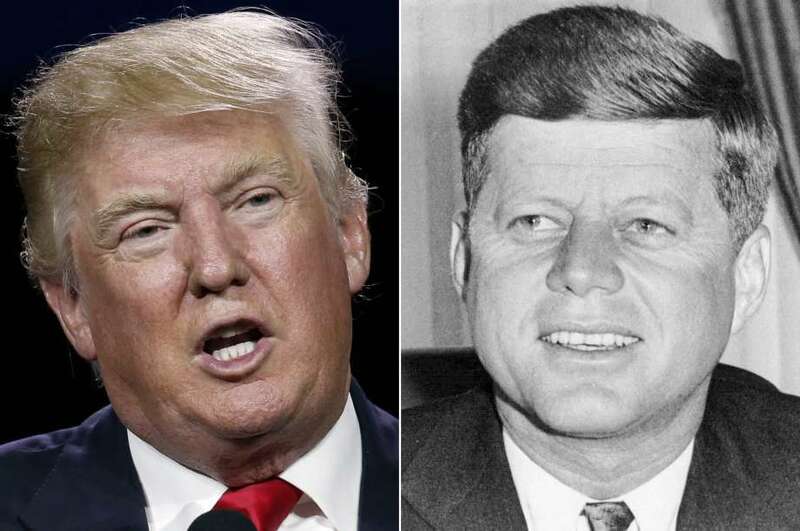 Of course if Kim started a nuclear war, which is hopefully very remote but possible, war will come, as Trump said plainly on August 8, 2017, with “fire and fury.” In October 1962 Kennedy’s speech to the nation on the Cuban Missile Crisis included this “fiery” rhetoric: “Third: It shall be the policy of this nation to regard any nuclear missile launched from Cuba against any nation in the Western Hemisphere as an attack on the United States, requiring a full retaliatory response upon the Soviet Union.” JFK concluded with the overall purpose of his actions: “Our goal is not the victory of might, but the vindication of right – not peace at the expense of freedom, but both peace and freedom, here in this hemisphere, and we hope, around the world. God willing, that goal will be achieved.” In 2017 we may look for a resolution to the North Korea crisis where history repeats itself. All through the Cold War Kennedy looked into the face of strategic MAD (Mutually Assured Destruction) without blinking and then chose to evoke the better angels of our nature. At the United Nations in his first year as president (September 25, 1961) Kennedy exhorted the world’s representatives: “Together we shall save our planet – or together we shall perish in its flames. Save it we can. Save it we must. Then shall we earn the eternal thanks of mankind and, as peacemakers, the eternal blessing of God.” President Trump would do well to aspire to the same. This entry was posted in Current Affairs, U.S. History and tagged Cuban Missile Crisis, Donald J. Trump;, John F. Kennedy, Kim Jong-un, North Korea crisis, Virtual JFK on August 9, 2017 by jwalsh2013.